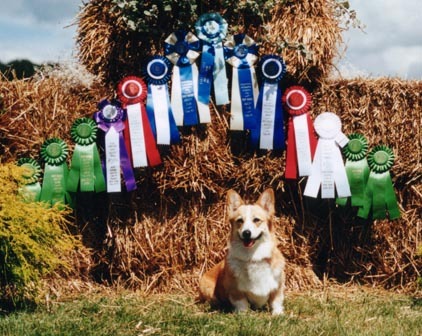 Here are a few of the Jimanie Corgis that have gone on to excel in the performance arena. Jimanie is extremely proud of Vache's Lady of the Lake (or Tee Tucker, as she is known to friends). Since the first weekend in October, Tucker finished her other excellent level agility title (all with 1st place), picked up her first master's leg (MXJ) and first MACH points and to cap it off, she finished her CDX with a first place over sixteen other Open A competitors. That's three new titles in three weekends in October and SEVEN titles for the year. Are we proud? You bet we are! Tee Tucker is sired by Ch. Llyswen Foreign Affair at Rumney, imported and owned by Jimanie and Foxllyn. 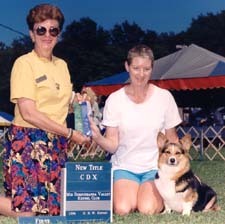 Tee Tucker was bred by Denise Scott of Vache Corgis and is owned, trained, handled and loved by Vonda Winkler. Whew, that is a mouthful! Her best friend and trainer is Donna Bowman. 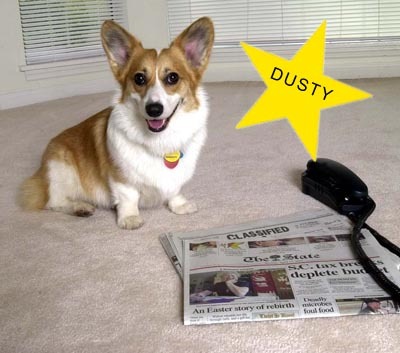 Dusty was bred by Jimanie and we are so proud of them both! Another we are proud to claim as a 'granddog' is "Jed" owned and trained by Lori Pasche. 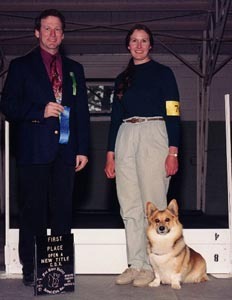 He is shown here completing his Companion Dog Excellent title. Jed is also pointed toward his conformation championship. He is sired by "Keegan" who was shown to his championship here at Jimanie when he had been leased for a year's time. Most recently, Jed took a second place in the American Bred class at the PWCCA 2001 National Specialty show. 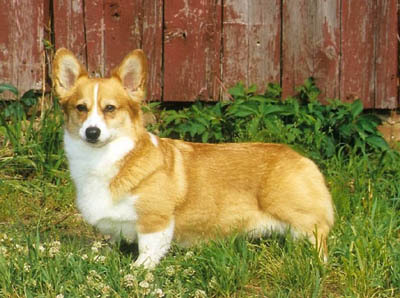 He was bred by Denise Scott of Vache Corgis and Linda Stoddard of Woodwynne Corgis. Champion Jimanie's Simply Southern Boy, UD "Rebel"
We are incredibly proud of him and his owner/trainer/handler,Teresa Tipton. Highest Scoring Champion of Record at the PWCCA 1998 National Specialty Show! Way to go guys! Jimanie's Black Opal, CDX (Polly) and her proud owner/trainer/handler, Melissa Erickson. Melissa bought Polly as a pup and has shown her in both the conformation and obedience rings. She is pointed toward her championship and finished her CDX in the obedience ring. Polly is working toward her Utility title and is the dam of several lovely young dogs now being shown in the conformation ring. We are proud of their accomplishments. Polly is sired by Ch. 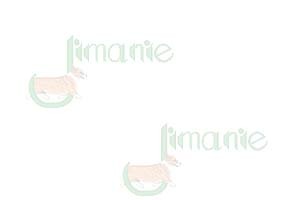 Pemland Special Request out of Jimanie's Mistress Merry C, a pointed daughter of Ch. Pennington Ramblin' Lad, ROM and Ch. Caralon's Chelsey of Horoko (dam of 4 champions).